As soon as I sat down to write this review, the words of the Paul Simon song, So mama don’t take my Kodachrome away, sprang to my mind. It is a bit like that because my job is writing, and having a reliable spelling and grammar corrector on hand at all times is a huge help. For my long-form writing and preparation of classroom materials for my teaching, I use the Grammarly editor to work with Microsoft Word documents. I could probably survive by using the inbuilt spell and grammar check in the word processors I use such as Word and Pages. However, I find that Grammarly picks up more complex grammar mistakes, so it is my go-to tool. Accurate grammar and spelling are vital in my job. But after trying a lot, it is the only online grammar checker that works for me. I spend a lot of my time each day at a keyboard, and predominantly online. It is during this time that the browser extension for Grammarly Chrome is such an indispensable tool to help me write mistake free. Why is the Grammarly Chrome extension so good? The Grammarly Chrome extension works almost anywhere you visit in your browser. There are three parts to the answer. One is that you can get the Grammarly Chrome extension for free. That is a very good first reason. Two is that Google Chrome is a very robust browser. You can get an extension for Safari, Firefox and Edge as well. But Chrome is a workhorse, and it handles the extra load without any hesitation at all. The third is that you have access to two different parts of Grammarly. First, there are the on-screen notices for spelling mistakes, which you can see underlined in red, and you can correct with one right-click. Then at the bottom of your screen, the Grammarly icon will show a small yellow circle if there are corrections and suggestions or any other potential grammar errors. By clicking the yellow counter, you instantly open the full editor to use the grammar check tool. You can watch this quick video of the app at work with my WordPress editor. By having access to both editor screens, you can save so much time. As you write, you can concentrate without distraction except that it checks your text for any obvious spelling error. But, you can turn it off if you want to just by clicking the extension icon in the browser menu bar. Then when you are ready, turn it back on and click through to the editor and the grammar tool to review your text and sentence structures. If you are article and blog writing using an online editor, it is a winner on all fronts. Everyone is writing online in one form or another. When users type, the extension is checking. Grammarly moves with me when I write a new mail in Gmail. The same familiar circle is in the bottom left corner. Even if you are not a full-time writer, you write emails, don’t you? If English is not your first language, Grammarly Chrome is very useful in helping you improve your English writing skills and to add variety to your communications. All you need to do is highlight any word, and there is a popup of suggested synonyms. What about Twitter? It is only 280 characters, but you can still have typos or misused words. Phew! Just as well I didn’t send that Tweet out to the world. Before I started on this post, I spend a few minutes on a title analyser site trying to come up with a reasonable headline title and to check that it would fit into a 60 character SEO title. I am always replying to comments on my blog or post them on other sites. It would be embarrassing for me to make an error in such a short text. Luckily, there is the extension’s spell check tool. There are so many features and uses. If I change browsers, which I do from time to time for some of my personal stuff, it is still there with me on Safari. 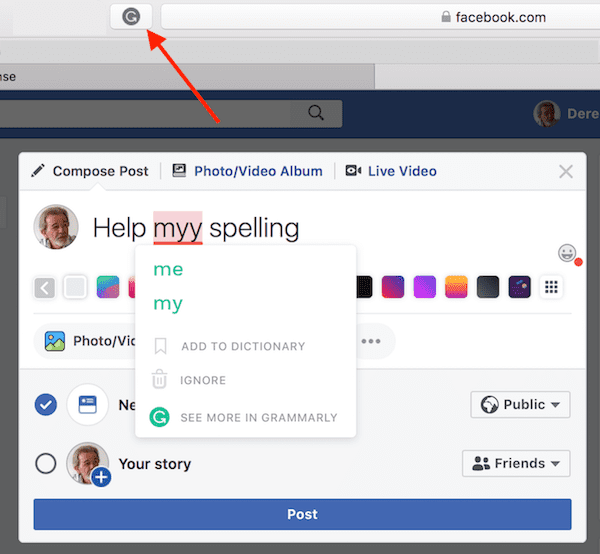 I only use Facebook for close friends, but I still want my writing to be as error-free as possible because they know I am a stickler for English grammar. The extension works on Facebook, Twitter, Google+ or any other social network or site you use. That is very good insurance against typos. There are two versions available. Grammarly free and premium and both allow you to use the Chrome extension. If you only need a spell checker and a little help to correct big grammar mistakes, then the free version will do an excellent job for you. However, if you write a lot, the premium version has so many features and advantages that can help you. The synonym suggestions are invaluable when you are looking for the correct word to suit a context. I also use the vocabulary enhancement tool a lot to cut down on repeated words, as well as always doing a check for accidental run-on sentences. The plagiarism check is very useful, especially if you accept guest content on your blog. I have caught a few content writers trying to palm off copied articles to me. If you use your phone a lot, there is also a Grammarly keyboard app for Android and iOS. I did a check on some associated keywords before I wrote this post, and I was surprised to find out that there are 165,000 Google searches every month for Grammerly. Clearly, there are still a lot of people who could do with some help with their spelling and grammer. Is Grammarly’s Chrome extension perfect? Definitely not. No online tool is 100% perfect. However, I can say from my experience that it finds close to 95% of common grammar errors and spelling mistakes. It is a big help and a huge time saver because it dramatically reduces the time needed to proofread. But the most significant benefit of the AI powered Chrome extension is that it goes wherever you go, and protects your writing in all its forms from Tweets to emails to 1,000-word articles. I never totally trust any electronic grammar and spell checker, but Grammarly does do most of the heavy cleaning, which leaves me to do the spit and polishing at the end. 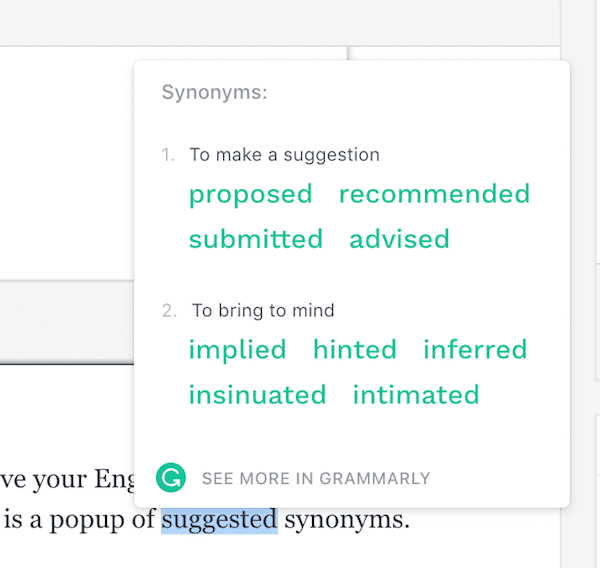 After using it every single day for more than two years, I can highly recommend Grammarly for all writers. 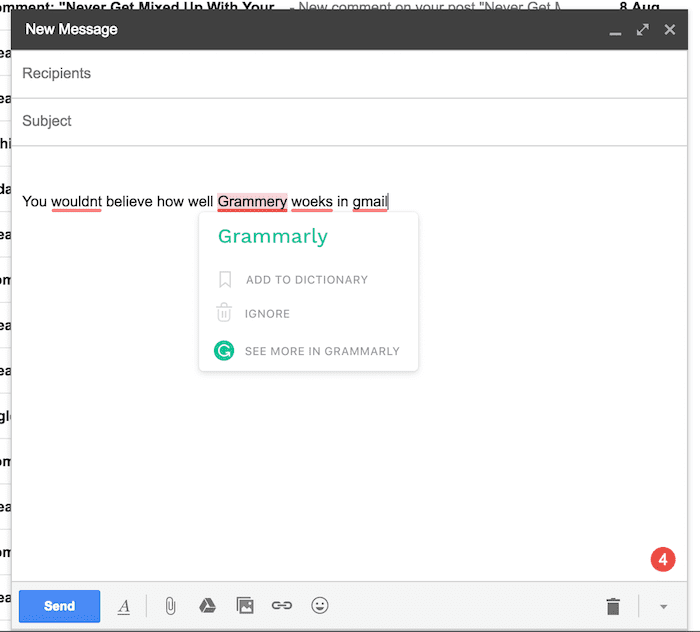 Grammarly is in beta testing with Google Docs. If you have a premium subscription, you can try it out now. I loved Grammarly ~ until it deleted my text – entirely!!! I clicked the red button and my whole letter, which I had spent an hour getting all the information correct and had reviewed – The whole letter deleted, except for the attachment I had scanned onto my computer and then the letter, deleted. How do I get it back? This has happened before – and I rewrote my information. However, I know it will happen again. In fact, I had forgotten that my writing would automatically be deleted when I hit the red button – and yes it was gone!. I like Grammarly and want to use it again. It is very helpful – if it doesn’t delete my work! You shouldn’t use Grammarly as a word processor. It is a checker. Write your letter in Word or another word processor and save it, then check your letter with Grammarly.